Photo from Flickr.com courtesy FrozenMeat. All rights reserved. After reading Download Uproar: Record Industry Goes After Personal Use - washingtonpost.com, you have to wonder if the recording industry will next be suing owners of Apple iPods who purchase music from iTunes and then copy it onto their iPods. Apparently, RIAA has filed a lawsuit against an Arizona man who copied legally purchased CDs onto his computer, claiming this is illegal. Except that the US Supreme Court has ruled that video recorder owners can legally make copies of copyrighted video content (TV shows) for personal use, and it has long been accepted that if you own a copy of a CD or vinyl record, you can make copies for your personal use. This doesn't seem to matter to RIAA. This is outrageous, anti-consumer behavior by the music industry. If they don't realize they are going to kill their entire business by treating customers like criminals, they deserve to collapse under the weight of their own lawsuits, or see scenes like the one above outside their corporate offices. What a stupid, ill-advised, reputation killing (as if there were any reputation left to kill) legal strategy this is. I didn't really do anything to deserve having my photo taken. 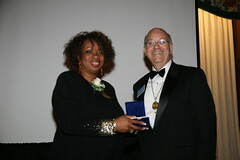 I was representing the Philadelphia Chapter at the dinner. The Chapter was one of the presenting sponsors for the Fellows Dinner, since we were the host chapter for the 2007 PRSA International Conference. So that's why I'm getting a piece of crystal from Debbie Miller. We wrote PRSA a check. W00t! In November, Steve competed in his first racquetball tournament in more than 30 years. This year's NJ Open Tournament was held in Woodbridge, NJ. This is Steve's video blog report on that competition. The employee kitchen at Professional Podcasts needed a new cooktop and when the installer came to put it in, we decided to make this quick video of how they did it. Thanks to Ralph Prate of Pro Installs for being a willing participant in our video and for doing the little commercial pitch for his business at the end of the video. Podsafe Music, "Sing Sing" provided by the Dave Manley Band. We're honored and flattered to be featured in the "Power of Two" newsletter. We look forward to working with the American Red Cross, and we urge everyone to keep them in mind, especially at the holiday season, when blood donations and contributions slow down and, but the need for ARC services does not. As we prepare for our Shabbat here in San Diego the Biennial Blog spoke with two rabbis about their personal Shabbat routines and how they make the Sabbath Day holy. Click on the play button below to listen in. Just as that meeting was ending, the lights flickered and went out, then came back on, flickered and went out again. And they stayed out for the better part of an hour. After a few minutes of confusion, the catering hall staff rustled up a supply of candles (see below) and the crowd shuffled in darkness to the top floor for the party. Networking in the dark may not be such a bad idea. Someone observed that it was hard for people to congregate in their usual cliques because they couldn't really see each other clearly enough to identify their friends, so people were actually talking to people they didn't already know. However, more than a few people commented that the candle-lit "ambience" was different and sort of nice. To which I say: Emperor, you have no clothes! This is just really poor business contingency planning. Let me explain. If I were planning a wedding for my daughters and spending tens of thousands of dollars at this catering hall, I would have had a conniption to find out that they have no backup power of any kind. How can you run a business where the central mission is to provide people a place to host lavish catered events, and not plan for the business contingency that the lights might go out? ExtraLife comic artist Scott Johnson has created a poster depicting the 56 species of Geeks. This is one of them, but his hair is too dark, and well, too hairy. Also, where are his glasses, huh? My dad, Murray Lubetkin, was a professional photographer. He taught it at the Central Institute of Photography in Newark, and later at the Photo Division at Fort Monmouth. He taught me photography back when light meters were optional equipment on Minolta SLRs (I still have his Minolta SR-1 with the little bracket where the add-on light meter is supposed to sit.) For years, I thought the Rule of F-16 was the only way to figure out exposure. We spent many happy hours photographing fall leaves together, and he was always especially proud that we used one of his autumn leaf photos in that 1974 yearbook -- with the only photo credit line in the entire book (I insisted on it.) One of his particular photographic obsessions was light reflected through displays of colored glass objects in retail stores, and I confess to trying to repeat some of his work there. Anyway, he fueled my enthusiasm for photography. Later, I managed to irritate the photographers at the newspaper I worked at by being one of the only reporters who could take his own picture (and I got more than a few spot news photos of fires and car crashes in the paper). 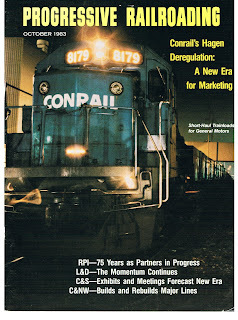 Later, as a corporate PR minion, many of the pictures I made for Conrail appeared in newspapers around the country, and a night photo I took of the railroad industry's first "just-in-time" train, KZLA, from Kalamazoo to Lansing for General Motors, made not only the cover of Progressive Railroading, but also was used to illustrate a William Greider article in Rolling Stone. Well, it's been more than 20 years since that photo made the cover. During the final 10 years of my corporate PR career, I relearned photography in the digital world, and produced publishable photos of news value for Standard & Poor's and the three banks where I sat for five years. In recent months, I've been very thrilled that our corporate photojournalism is still delivering high impact imagery for business publications. Photographic assignments we took on for SBN Publications have landed our work on the cover of the October and December issues of Smart Business Magazine's Philadelphia edition. Any shooter will tell you that getting covers like this just inspires them to do more, and do better, and it definitely perks me up and reinvigorates my desire to produce great quality photojournalism that will make my clients happy. The program runs about 1 hour 10 minutes. Check out this on-air live battle on CNBC yesterday (kudos to CNBC for actually posting the clip) http://urltea.com/2a2v. Outside observers would easily see such sales as an admission that the firm was selling something that was a bad investment. People on Wall Street don't seem to see any conflict in Goldman unloading these barrels of waste on teachers' pension funds while going out the back door and shorting them. Watch how the host of the show and the guest gang up on Charlie. Live business television at its most remarkable. Host and correspondent both lose their temper. Amazing stuff!